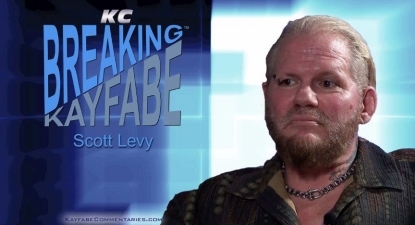 “Breaking Kayfabe”, arguably Kayfabe Commentaries‘ most unique and original concept for a shoot interview yet, is back in — “Breaking Kayfabe with Scott Levy”. If you’re new round here, the series is wrestling’s version of Oprah’s Next Chapter or Barbara Walter’s Special, as host Sean Oliver sits down with a wrestling star who has led as interesting a life away from the ring as in it, to discuss the ups and downs of their personal lives. This time around it’s Scott Levy, better known as Raven, to discuss everything from childhood trauma to conspiracy theories in a wide-ranging and entertaining 97-minute interview. Right off the bat I should point out that this DVD isn’t for everybody. If you’re looking for the dirt on WCW, ECW, and WWE, or for insight on booking, ring psychology and the finer points of pro wrestling, this is not for you. However, if you’re looking to hear about the man behind the gimmicks and the very real struggles behind success, then this is definitely the DVD for you. I was skeptical of the interview going in, fearing that Scott Levy would be more comedian than willing interview subject, using his sense of humor to deflect the questions. But that is not the case. Though Levy is funny throughout, he remains open, direct and honest, answering all questions put to him, no matter how personal, taking the interview seriously from start to finish. If there was a structure or format to the interview going in, it certainly doesn’t show. And while that kind of freewheeling approach may hamper other more traditional shoot interviews, it works extremely well here. The result is a free flowing conversation between friends that is both entertaining and engaging. Though the interview isn’t broken into specific sections like other Kayfabe Commentaries interviews, there are three main points of interest which I’ll touch on in this review: Scott Levy’s childhood, drugs, and marriage. Scott Levy’s childhood is where the interview begins. Scott describes how his father, Paul Levy, a journalist (and eventual senior editor of the National Enquirer), inadvertently destroyed Scott’s sense of self-worth when Scott was growing up. Scott Levy details how his lack of self-worth and “normal” relationships at home made it hard for Scott, as a young man, to connect with other kids or to fit in. This portion of the interview I found to be extremely interesting. Though neither Oliver or Levy say it, one can easily see the issues at home and in school being the core building blocks of the “Raven” character, a character closer to who Scott Levy was/is than anything before it. The second subject of interest surrounds Scott Levy’s abuse of drugs and alcohol. Levy talks about smoking marijuana at the age of 12, his use of cocaine getting the better of him in WCW, and alcohol sending him to the hospital for over a week. Levy is brutally honest about using drugs and alcohol and their long-term impact on not just his physical health but his mental and cognitive health as well. Later, when Scott Levy is asked if he is a “genius”, Levy responds by saying he’s “probably more of an idiot” for making such bad decisions. That pretty much sums up this part of the interview. Though Scott Levy was a heavy drug abuser (he’s not technically an “addict”, he says) he has clearly come through the other side clean and sober. This portion of the interview, coupled with Levy’s insights on talk therapy, may well offer inspiration for those who have or are currently struggling with substance abuse. Marriage is an interesting topic. Sean asks why it took Scott until January 2007, at the age of 42, to settle down and marry and why, in the end, the two aren’t still together as husband and wife. It’s in this part of the interview that the man those closest to Levy see, away from the ring, shines most brightly. Levy, through the highs and lows, triumphs and letdowns, is a kind, respectful, thoughtful man. And nowhere is that more clear, in my opinion, than is this portion of the program. It’s not all serious, though. Along the way the two discuss everything from conspiracies and hobbies, to food and the type of programs on Levy’s DVR. There’s also a tremendous section devoted to the independent contractor challenge that Levy brought against WWE in which Levy explains why he brought the suit, why so few attached their names to it, and why, ultimately, it failed. Add to that the “Final Five”, covering such topics as dining with one person dead or alive, most irrational fear, and who would play Raven in a biopic, and you end up with a very entertaining interview. Clocking in at 1 hour and 37 minutes, “Breaking Kayfabe with Scott Levy” is easily, for my money, one of the best shoot interviews of 2016 from Kayfabe Commentaries or anyone else. 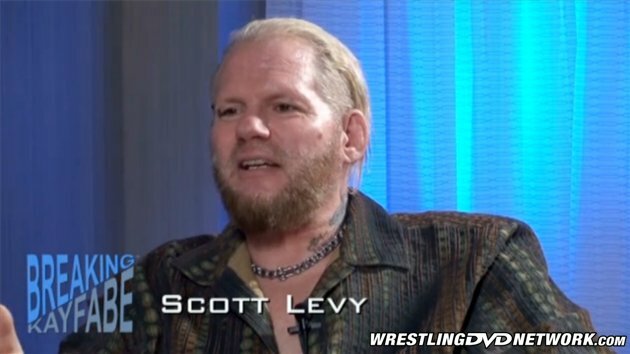 No matter if you’re a fan of Raven or a fan of Kayfabe Commentaries, this is a must-see interview that will change how you look at Scott Levy forever. Quote the critic, ‘Nevermore’. You can get hold of “Breaking Kayfabe with Scott Levy” now at KayfabeCommentaries.com. This one’s available to own on DVD, stream instantly, or download to your device for later.